It was a long trip from Savannah, Georgia back to Los Angeles. It took about four days and I was very sick of (almost) endless highways, subway sandwiches and beat up gas station bathrooms. Of course, I still found some time to be a tourist. Tombstone is a tiny little town in the southeast corner of Arizona, just below Tucson. 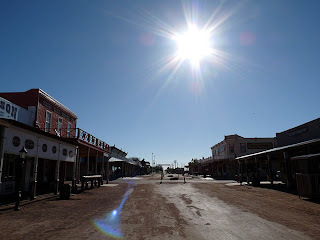 Billed as the town that is "too tough to die", it is the site of the famous gunfight at the O.K. Corral. This shoot out between the "good guys" (including Wyatt Earp) and the "bad guys" happened on October 26, 1881. 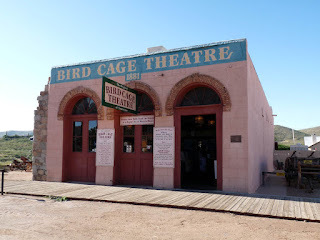 Only three men were killed and the fight lasted a mere thirty seconds but the long arm of the law won and law was restored to this wild frontier town. I arrived very early in the morning and the busiest place was The Longhorn restaurant which served up a mean cowboy breakfast. 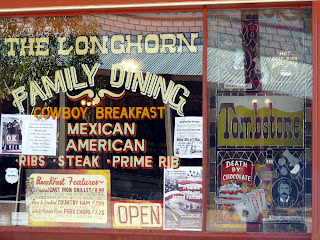 The menu gave a complete history of the building and I thought it was interesting to find out that the Longhorn was once a saloon called the Bucket of Blood. 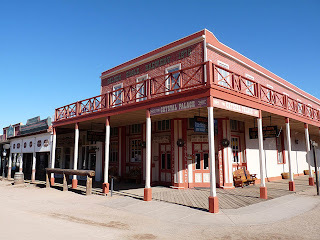 There were various old western buildings which, unfortunately, I didn't have the time to explore. Apparently they also recreate the gunfight which may just justify a trip back. I'm going to cheer for the baddies though. Just to shake things up. The world's largest rosebush is also in this town but I didn't see this either. Dusty wasn't into the tourist stuff. 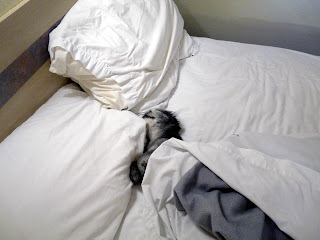 He slept a lot during the trip and enjoyed the Motel 6s immensely.